Our premium line of gardenware – inspired by classical architecture and story book gardens – includes flower pots, sculpture, bird baths, tile, finials, and toadhouses. Each piece is handcrafted using traditional wheel throwing and hand-building methods. Mass production methods are never used. Each item is an original work of art and no two are exactly the same. While our style is classic, the interpretation is modern, charming and often humorous. Sure to be a conversation piece in your garden for years to come. Our work is specifically designed to be frostproof, and has been tested to withstand Zone 5 winters (-20 degrees F) allowing sculpture to be left outdoors to be admired all year long. Enjoy the look of terra cotta without the disappointing frailty. 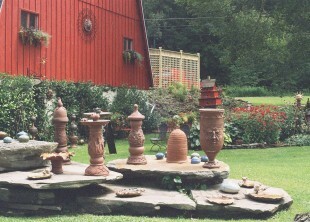 The pieces of Goff Creek Pottery that grace your garden are destined to become family heirlooms. Hand-crafted elegant gardenware made to last a lifetime. Our specially formulated clay is fired to high temperatures, producing rich color and an antiqued patina usually seen only on vintage items that have weathered for years, plus durability that far outlasts terra cotta.